In this May 9, 2013 file photo, a worker pushes shopping carts in front of a Wal-Mart store in La Habra, California. Wal-Mart will now let you pay with its phone app at all 4,600 stores nationwide. The effort is part of Wal-Mart's strategy to make shopping easier and faster, while learning more about consumer behavior. With Wal-Mart Pay, the cashier scans a QR code on the phone screen to charge a credit, debit or Wal-Mart gift card linked with the account. It differs from Apple, Samsung and Android Pay, which involves tapping your phone next to a payment machine with a wireless technology called NFC. In December, Wal-Mart said it would develop its own digital wallet rather than honor existing systems from Apple and others, though Wal-Mart said it isn't ruling out third-party wallets in the future. Retailers have been pushing their own systems in part because they retain control. 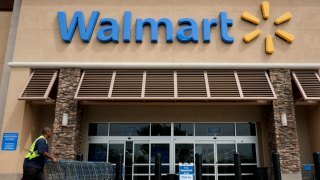 Daniel Eckert, senior vice president of services at Wal-Mart U.S., says data from the app will be used to improve the shopping experience. One way, he said, would be to use past shopping behavior to build a personalized shopping list. The customer could then delete or add items. He said such features would be done only with a customer's permission. Wal-Mart joined other retailers in backing CurrentC, a system that was also based on scanning codes rather than NFC. But the beta test of the system faltered as Apple Pay became more popular. The consortium last week suspended its launch indefinitely, saying it plans to focus on other aspects of its business. Apple Pay, in particular, has been credited with boosting interest in mobile payments, though many consumers still use traditional plastic cards because it's not difficult to pull one out. Although the number of stores accepting NFC payments has grown, it's still relatively low, and the stores with the right equipment still need cashiers familiar with it. Wal-Mart says no payment information is stored on users' phones or at registers. Rather, card information is stored on Wal-Mart servers. By contrast, Apple, Samsung and Android Pay use alternative card numbers for added security, so if hackers break into a merchant's system, they wouldn't be able to go on a buying spree. Wal-Mart uses regular card numbers, but it insists it keeps the information secure. Wal-Mart Pay is built into Wal-Mart's app, which has 20 million active users. The Bentonville, Arkansas, company finished upgrading stores in 25 states last week to complete the national rollout. Eckert said 88 percent of Walmart Pay transactions are from repeat users.